A walk from the Fasach to the Shielings, along the River Hamara. (4 miles, 2 hours). From Milovaig, drive back through Glendale village and take the first right after the children’s play area (just before the road begins to climb steeply). Follow the road as far as it goes, until you reach a large turning area. Park in the turning area, allowing plenty room for lorries to turn around. Go through the double gates onto the unmetalled road and follow it until the road begins to turn upwards. Leave the road at this point and pick up a well-worn quad-bike trail leading directly towards MacLeod’s Table North (directly in front of you). Keep an eye out for Roe Deer, which are common along the Riverbank and open moorland to your right. After a mile or so, you will reach a well-preserved, ruined croft house, set within a bend in the river. Continue following the quad-bike trail, which now begins to diverge away from the River, until you reach the Shielings. The Shielings are a series of domed mounds, set beside a burn, which are the remains of a small settlement of ‘Bee-Hive’ houses. If you are lucky, both sea eagles and golden eagles can be seen quartering the high moorland ridges around. From here it is possible to continue your walk further towards the foot of MacLeod’s Table North. Return via the quad-bike trail, but once past the ruined croft house, leave the quad-bike trail and closely follow the riverbank instead. You will be rewarded with a series of beautiful waterfalls that cascade into shallow pools, with a backdrop of MacLeod’s Tables North. Remain on the riverbank until you reach the fence that leads rightwards directly back to your car. 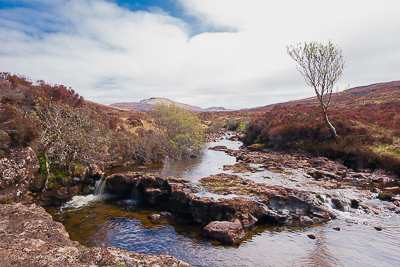 Falls on the River Hamara and Healabhal Beag.